In January 2009 over 1300 Palestinians were killed in Gaza. Around 300 of them children. When the ceasefire was declared, BAFTA winning film-maker Jezza Neumann arrived to follow the lives of four children over the course of a year. Through their eyes, and in their words, Children of Gaza gives us a unique insight into the impact of war on vulnerable young minds. Despite the horrors they witnessed, Amal 9, Mahmoud and Omsyatte 12, and Ibraheem 11 still have hope and humor while living in the ruins of the Gaza Strip. 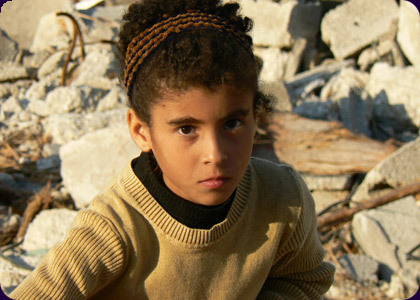 Increasingly isolated by a blockade that prevents anyone from rebuilding their homes and their lives, Children of Gaza is a shocking, touching and uniquely intimate reflection on extraordinary courage in the face of great adversity. Based in London, Jezza Neumann began his television career as a runner. He trained and filmed on various pilot projects for True Vision gaining his first broadcast camera credit with the film Eyes of a Child for BBC One. Since then he has filmed various international award-winning productions for Channel 4 and HBO. He specializes in the use of mini DV, using Cokin filters and the menus within the cameras to enhance the picture quality. In 2007, he won three BAFTA awards for his previous film for Channel 4, China's Stolen Children.